Wisdom teeth are the final set of molars that people usually get removed either in their late teens or early twenties. These teeth may erupt well and become useful to you, but mostly they are impacted and need to be extracted. Not everyone gets four wisdom teeth. Some develop only one or two, while some don’t get any. Some people get more than four wisdom teeth as well; however, this is very rare. Impacted wisdom teeth are teeth that are not able to erupt completely into the mouth. They usually do not have enough space to develop normally. They either remain completely hidden in the gums or emerge partially. Also, there are chances of the impacted wisdom teeth affecting the other teeth around. They may grow in an angle that causes problems for the teeth next to them. This can lead to immense pain and other dental problems; hence it is advisable to get them extracted by a dental surgeon. Some dentists recommend wisdom teeth removal, even if they are not impacted. This is mainly to avoid problems in the future. • Pain around the tooth. • Swelling around the jaw. • Bad breath and unpleasant taste in the mouth. • Difficulties in opening the mouth completely. Fully impacted wisdom teeth never break through the gums. Thus, they lead to many complications. At times, the wisdom teeth may break through the gums partially, making a part of the gum visible. As mentioned before, some wisdom teeth grow incorrectly, causing disturbance to the other teeth around them. They lead to the overcrowding of teeth, leaving you with no other option but to get them removed. There may be no need to extract all of your wisdom teeth. It is best to consult with a dentist to know whether you need to remove all your wisdom teeth or only a few. Wisdom teeth can grow like other teeth in our mouth, without creating any pain or discomfort. However, most of the time they do grow, causing a lot of pain and aches. In such a situation, it is important to consult your dentist to get the problem fixed. He or she may mostly recommend to remove the teeth to relieve the pain. Wisdom teeth can lead to excessive pain while chewing food. There are chances of food particles getting stuck in between the gums and the tops of your teeth. If you are unable to clean your wisdom teeth well, the food particles will stick there for long and lead to other problems like decaying, infection, etc. Hence, in such a scenario, you will have to get the wisdom teeth extracted. Wisdom teeth growing in the upper jaw can lead to sinus problems. 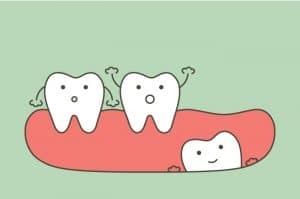 When the roots of the wisdom teeth develop, they can push the sinuses and put pressure on them. This can lead to problems like headache, sinus pain, and congestion. In this case too, your dentist will recommend extracting the wisdom teeth to relieve the pain or congestion. As the wisdom teeth grow at the back of your mouth, you may find it difficult to clean them thoroughly with your brush. Also, their position is such that there are high chances of the bacteria growing and hiding. If the bacteria are not cleaned properly, the teeth will develop cavities. And because of their position, the dentist will not be able to fill the cavity as well. Hence, the best solution for this would be to get them extracted. Pericoronitis is a condition in which the wisdom teeth grow partially through the gums, leading to problems like inflammation and infection. This mainly happens because the soft tissues around the wisdom teeth trap food particles that lead to the formation of bacteria. The formation of bacteria can then lead to an infection that may cause inflamed gums. The solution to this problem is the same; get the wisdom teeth extracted. What Is The Procedure For Extracting The Wisdom Teeth? Wisdom tooth removal is carried out by a dentist or a dental surgeon. The very first thing that your dentist would do is take an x-ray of your mouth. This will help him or her to determine the condition of your wisdom tooth. After examining the x-ray, the dentist will ask you to take an appointment on the suitable date to get the extraction done. On the day of your appointment, you can expect the dentist to begin the procedure by giving you an injection of local anaesthesia. The anaesthesia will numb the tooth as well as the area surrounding it. In rare cases, patients are given general anaesthesia. Even in this case, they are allowed to go home on the same day. Once the area has been numbed, the dentist will begin working on it. If the tooth has not emerged through the gum, the dentist will make a small cut in your gum to access it with ease. If there is any bone covering the tooth, then the dentist will have to remove a small piece of the bone too. The next step involves cutting the tooth into smaller parts. This will make it easy to remove the tooth from the small opening. If the tooth has broken through the gum, the dentist will not make any cut on your gum. The dentist will rock the tooth back and forth to widen the tooth socket before taking it out completely. You may feel slight pressure because of this. However, you will not experience any pain as the area will be numb. If the dentist has made a cut in your gum to remove the tooth, then he or she will stitch the same. These will be dissolving stitches that may take around 7 to 10 days to dissolve. After completing the entire process, the dentist will place gauze over the site and ask you to keep biting your jaws together to create pressure. This will help in the formation of a blood clot in the empty tooth socket. Blood clots are very important for the healing process. You may have to do bite on the gauze for up to an hour. The entire procedure may take about 20 minutes. However, the time may vary from case to case. If the case is too complicated, the dentist may require more than 20 minutes to complete the process. The recovery from wisdom tooth surgery will take about two weeks. With each passing day, the condition of the patient will improve. In the first 24 hours, you can expect the blood clot to form in the empty tooth socket. As 2 to 3 days pass, the swelling that may have occurred due to the wisdom tooth will improve. In about 7 days, you can expect the stitches to dissolve (if any). In 10 days, the soreness and stiffness on your jaw should go away. In a span of 14 days, any mild bruising that may have occurred on your face will heal. To speed up the recovery, the patient will have to encourage the formation of a blood clot in the empty tooth socket. Blood clots can reduce bleeding, guard the wound from infection, promote the growth of new tissues, and protect the exposed bone. To prevent the dislodging of the blood clots in the first 24 hours, the patient should avoid brushing the teeth that are right next to the site. Also, rinsing the mouth too many times should be avoided. Any food that requires chewing should not be consumed for at least a day or two. Activities like smoking and drinking of alcohol must be avoided too. The patient must opt for soft or liquid foods to prevent damaging the wound. You can have soups, fresh fruit juices, jelly, soft noodles, mashed potatoes, etc. on the first day after the surgery. Such food items will not disturb the surgical site and help it heal quickly. To relieve the post-surgery pain, the dentist may recommend the patient to hold an ice pack on the cheeks near the extraction site to soothe the area. Also, to prevent too much bleeding, the patient may be asked to keep his or her head raised while sleeping. Book An Appointment For Wisdom Tooth Extraction Today! If you want to get your wisdom tooth extracted, you can get in touch with us. You can contact us online and book an appointment by calling 1300 99 1300 today.